I have submitted my author proposal to Arcadia Publishing for a vintage postcard book covering the piedmont section of North Carolina. I sent the proposal to the acquisitions editor electronically a few minutes ago. It felt good to mark that as “DONE” on my to-do list. I have been doing the necessary research to write the postcard captions a little at a time, so I’m well on my way to having many of the captions written. The book I have proposed to Arcadia Publishing should be a good companion book to my first vintage postcard book, The Blue Ridge Mountains of North Carolina. I anticipate that it will cover 32 counties in central North Carolina. I proposed the following three chapters in the book: Metrolina, The Triad, and The Triangle. I’ll post on my blog as soon as I know if Arcadia Publishing gives me the go-ahead to write The Piedmont of North Carolina. With my “Writing Plan of Action” in place as of yesterday, today I turn my attention to striking a balance. I have the luxury of not depending upon my income from writing to keep me afloat. I would have drowned a long time ago if that had been the case! My income from writing thus far officially qualifies it as a hobby, according to the Internal Revenue Service. That means it does not matter how much writing puts me “in the red” financially; it’s just a hobby. Don’t get me wrong; I would love to be able to make a living by writing. That’s what all writers dream of and aspire to, but few of us achieve that level of success. It would be marvelous if my historical novel manuscript, The Spanish Coin turned out to be “the Great American Novel,” but how often does that happen? I certainly won’t gain fame or fortune writing vintage postcard books like The Blue Ridge Mountains of North Carolina, but it is a thrill to see my name on a book as the author. As I jump into my new “Writing Plan of Action” this week, I want to keep all facets of my life in balance. Writing and everyday life tend to leave no time for playing the mountain dulcimer. I’ll never become proficient at playing that lovely stringed musical instrument from the Appalachian Mountains if I don’t practice. Playing the dulcimer a few minutes each day, studying the Bible, visiting the sick and homebound, walking the dog, quilting, sewing, doing needlework, and reading for pleasure are all things I need to make time to do. Those are the activities that tend to get squeezed out as I get absorbed by the self-imposed demand to write, write, write. Tomorrow I will make yet another attempt to strike a balance in my life. A great bookstore in Raleigh! 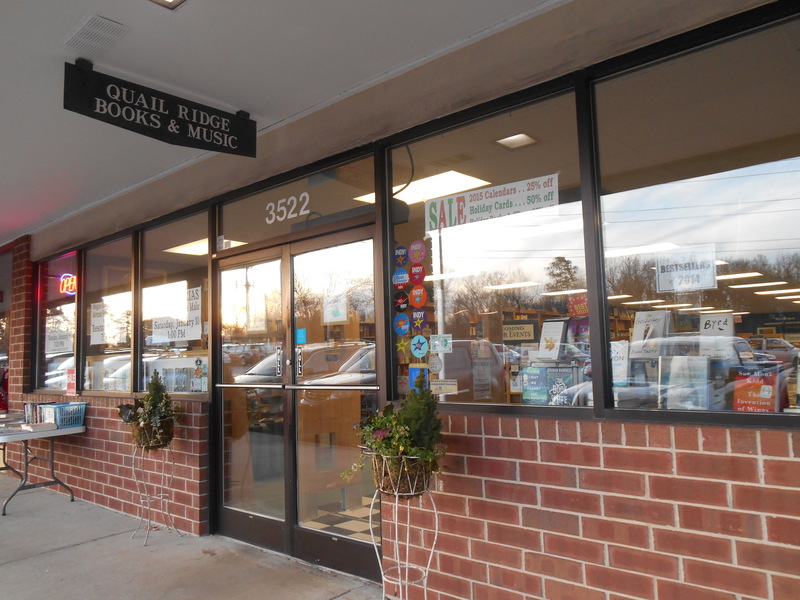 I finally got to visit Quail Ridge Books & Music in Raleigh! What a wonderful independent bookstore! Window at Quail Ridge Books & Music in Raleigh. I went in and introduced myself to Ted. I showed him my vintage postcard book, The Blue Ridge Mountains of North Carolina, and he immediately placed an order for several copies. They should be on the shelf at Quail Ridge Books & Music by now. If you live in the Raleigh area, please patronize Quail Ridge Books & Music and thank them for making my book available to their customers. Entrance to Quail Ridge Books & Music in Raleigh. 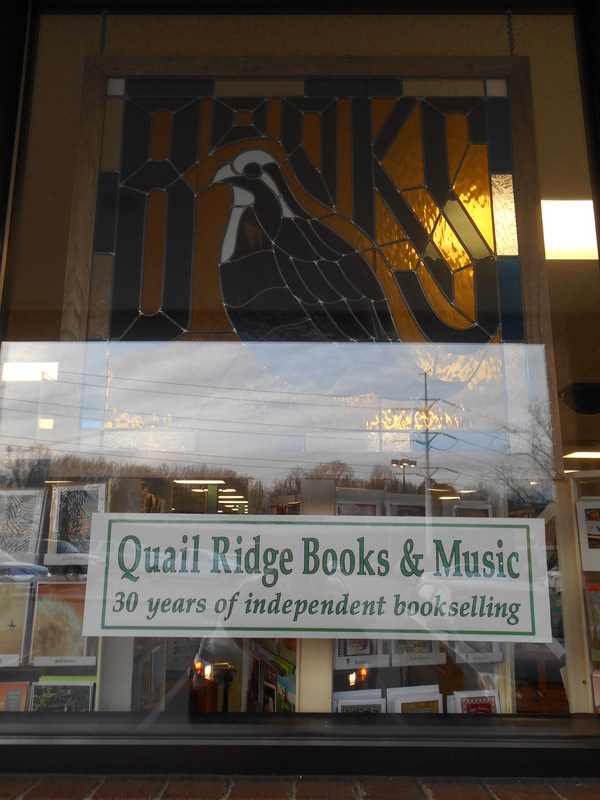 Quail Ridge Books & Music hosts an amazing number of author events. Perhaps someday I will be fortunate enough to be invited to have a book signing there. They had a display about upcoming author events. I counted 37 author events the store is hosting before the end of February. That is extraordinary! Thank you, Ted at Quail Ridge Books & Music! My sister and I have enjoyed shopping at the used bookstore in Sylva, North Carolina, that is operated by the Friends of the Jackson County Friends of the Library. It is a marvelous store and the volunteers there are always very helpful and welcoming. I knew there was another bookstore in the small town of Sylva — City Lights. We just never had taken the time to visit it. I’m not sure why. It is a gem and another example of a small town in the Blue Ridge Mountains that supports an independent bookstore. I love the Indies! 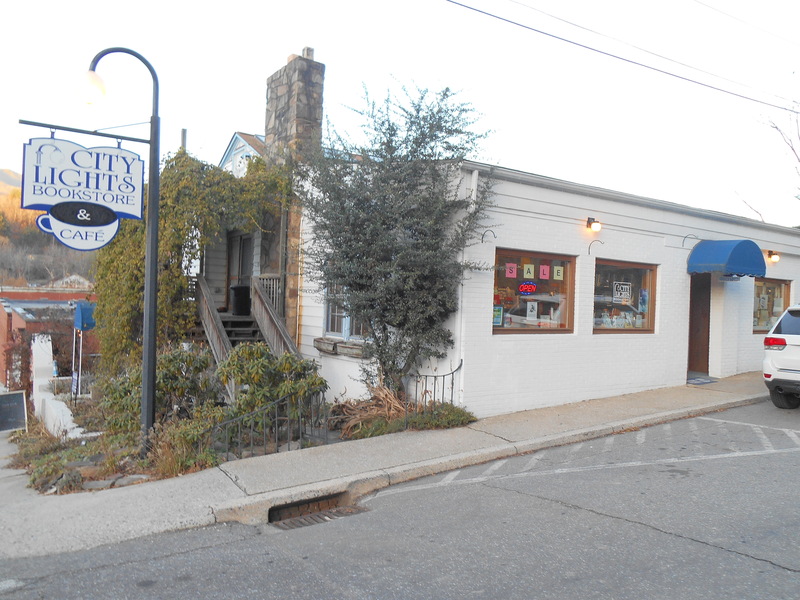 We visited City Lights Bookstore in Sylva in December. I met Chris, the owner. There was only one copy of my vintage postcard book, The Blue Ridge Mountains of North Carolina, remaining on the shelf. Chris asked me to autograph it. I was pleased to be asked to sign the book, although autographing my book is the most unsettling thing I do. It doesn’t look like the signature of an author. It lacks flair. It’s legible. It’s not pretty. It seems silly, but I think I need to practice writing my name. I have fairly good penmanship until I put pen in hand to autograph a copy of my book. City Lights Bookstore in Sylva, North Carolina. City Lights sells new books and used books. It shares a building with City Lights Cafe. In futures trips to Sylva, we’ll make time to visit both bookstores and give the cafe a try! Most people take December 31 or January 1 to reflect on the last year. Leave it to me to wait a few days. I can procrastinate with the best of them! Looking back on 2014, I realize what an exciting writing year it was for me. I celebrated the following firsts: (1) My first book, a vintage postcard book, The Blue Ridge Mountains of North Carolina, was published on August 25 by Arcadia Publishing; (2) My first author event was held at the public library in Harrisburg, North Carolina, on September 11; and (3) My first book launch was held on September 21. In the last three months of 2014, I had additional author events at public libraries in Cabarrus and Haywood Counties, North Carolina. Two whirlwind trips to the mountains of North Carolina in December to promote my book, to thank bookstore owners for selling my book, and to introduce my book to other bookstore and gift shop owners were my first forays into commercial book promotion. In my spare time, I have done a bit of research in preparation for submitting an author proposal to Arcadia Publishing for a Piedmont North Carolina vintage postcard book in 2015, but most of my time has been spent promoting the Blue Ridge Mountains book. That book is my primary focus. I have two author events scheduled in April and May. With the holidays behind me, it is time to turn my attention to lining up additional author events this spring and summer. Last week I took time to write a 1,899-word piece to enter in the Southern California Genealogical Society’s 2014 GENEii Nonfiction Writing Contest. I’ll talk more about that and my subject matter in another blog post this month. The winner will be announced on May 1, 2015. Sometimes I don’t think I get much accomplished. It’s gratifying to take a few minutes on December 31, January 1, or even January 4 to remember what I did in the last year. Will I be as productive in 2015? Stay tuned!